Hello, it’s Teresa here with some ideas that I hope will knock your socks off because today I’m talking to you about Shoes, (AND Strengths). 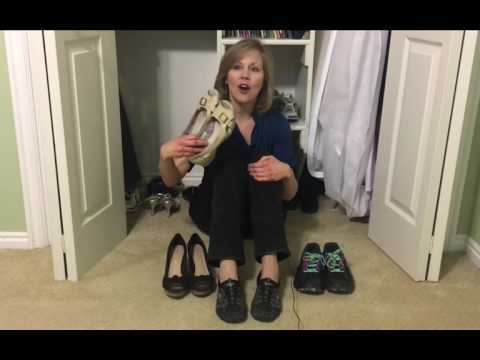 As I sat in my closet (actually it was my daughter’s closet – you can see her recently worn bridal gown bag hanging up behind me), I started thinking deeply about shoes and the various types we all wear. Some shoes work best for working and others are best for play. Somehow it got me thinking about the innate core strengths each of us brings into this world. So here are a few of my thoughts (or you can just watch the video below). The shoes I wear most are my “connector shoes.” They are built to be comfortable & allow me to connect with others without worrying about my feet. They are very supportive. I can Work hard in these shoes to meet the needs of those I’m serving in my daily work as a teacher. Finally, there are my “peaceful shoes.” They are the next best thing to being barefoot shoes. They’re comfortable, relaxed, and very practical. My feet feel at peace in these shoes. People are like shoes. We all have innate core strengths and we usually feel most purposeful in life when we share our gifts, talents and strengths with others. It’s important that we also appreciate and value the innate gifts and strengths of others. Embrace and value your core strengths, appreciate and value the strengths of others and be willing to increase your character by trying on a different kind of shoes, in other words be willing to have a growth mindset and strive to stretch yourself to develop strengths in other areas. That’s how your build CHARACTER. In a nutshell, love your shoes, love others’ shoes and try on a new pair every now and then, just for the fun (and the growth) of it. To find out more about YOUR innate core strengths, take the FREE Hartman Personality Profile Test, Click HERE. To learn more about The Power of Strengths, Click HERE.